I certainly am. I need reminders and prompts to help keep me organized. 4 weeks before publishing date: Send emails to authors, explaining your editorial process, giving them deadlines and instructions. 2 weeks before publishing date: Send a reminder to editors, asking them to proof-read the post for publication. 2 days before publishing date: Send an email to your Editor-in-Chief, asking them to approve the post as ready for publication. Let’s see an example of how to use Reminder. We’ll create an email that will go out 4 weeks before posts are published. The email will explain our site’s editorial process. 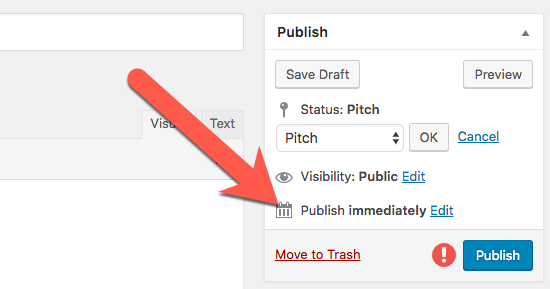 Reminders is an add-on to PublishPress, so you will need the main PublishPress plugin installed first. Download and install the Reminders add-on. The Reminders add-on does require you to have an active membership at PublishPress.com. Ther Reminders add-on can be download from the “My Downloads” page. In your site, go to “PublishPress” then “Notifications”. In the Title field, enter “What you need to know before writing”. 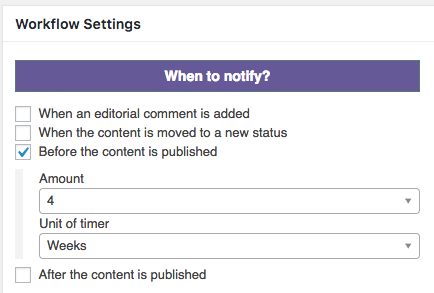 Under “When to notify”, look for the “Before the content is published” option. Now you can choose when the notification will be sent. In this example, we’ll set the “Amount” to “4” and the “Unit of timer” to “Weeks”. In the “For which content?” setting, you can choose a particular Post type or Category. In the “Who to notify?” setting, I’d recommend send this email to the “Authors of the content”. In the “What to say?” area, you can create your own notification. 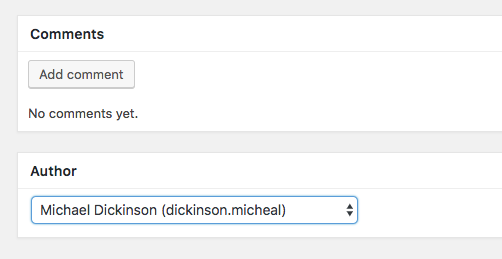 This post shows how to use dynamic tags in your notifications. Click “Publish” to activate the notification. In this part of the process, you create the content that will trigger the notification. 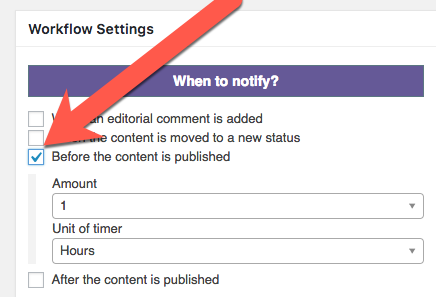 When creating the post, click “Edit” in the “Publish immediately” row. Choose the date when this post is scheduled for publication. This is the date that will trigger your reminder notifications. In the example below, the reminder emails will be sent 4 weeks before August 2, 2018. Don’t forget to choose the author for the content. This is the person who will receive the reminder email. 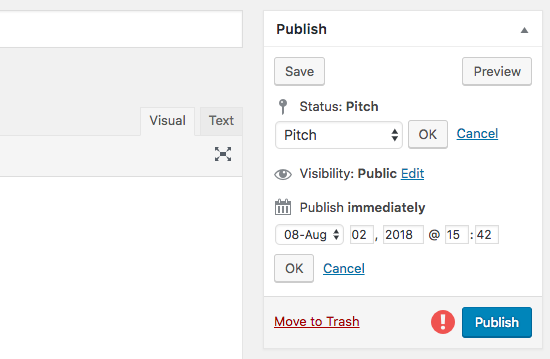 On a normal WordPress site, look for the “Author” box at the bottom of the screen. 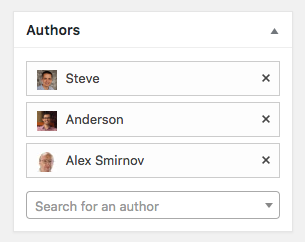 However, if you’re using the Multiple Authors add-on, you can choose as many authors as you want. All of them will get your notifications, and be credited as authors of this Post. Finally save your post in any status you want except for Published. This post does not need to be published for another 4 weeks! 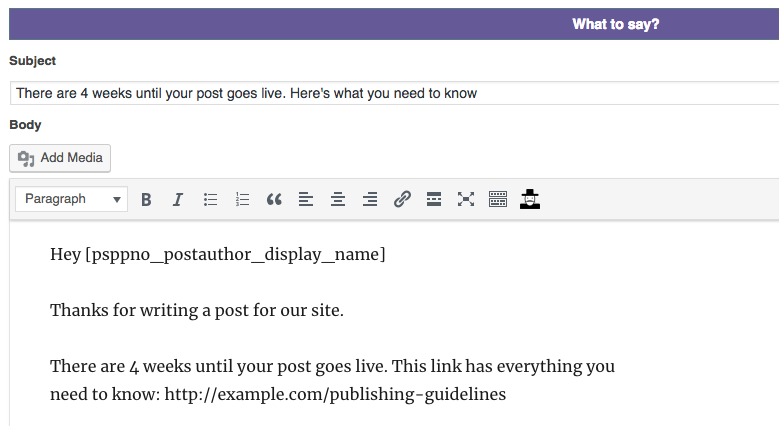 If you’re wondering what options you have for saving the content, check out this post: what are the default post statuses in WordPress? One tricky part of sending reminders is it’s not easy to verify that the notification went out. After all, the reminder may not not going to your email address. Plus, you also need to remember to check exactly 4 weeks before the scheduled publication date. So if you’re sending a lot of emails, I always recommend installing a plugin such as Email Log. This plugin records all out going emails from your WordPress site. After setting up your notifications, you can always go back to the Email Log plugin to check that the notifications were sent successfully. We use Email Log to verify all sorts of things on our site, including whether subscription reminders, password resets, and other important emails are working.